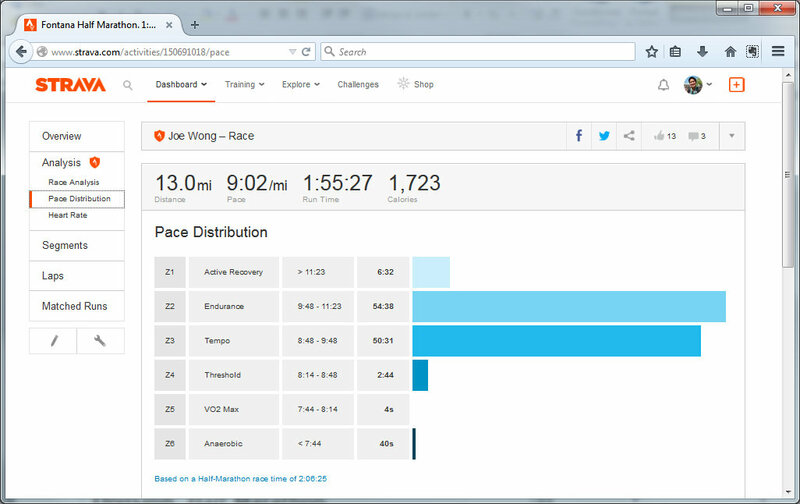 13.1 mi. 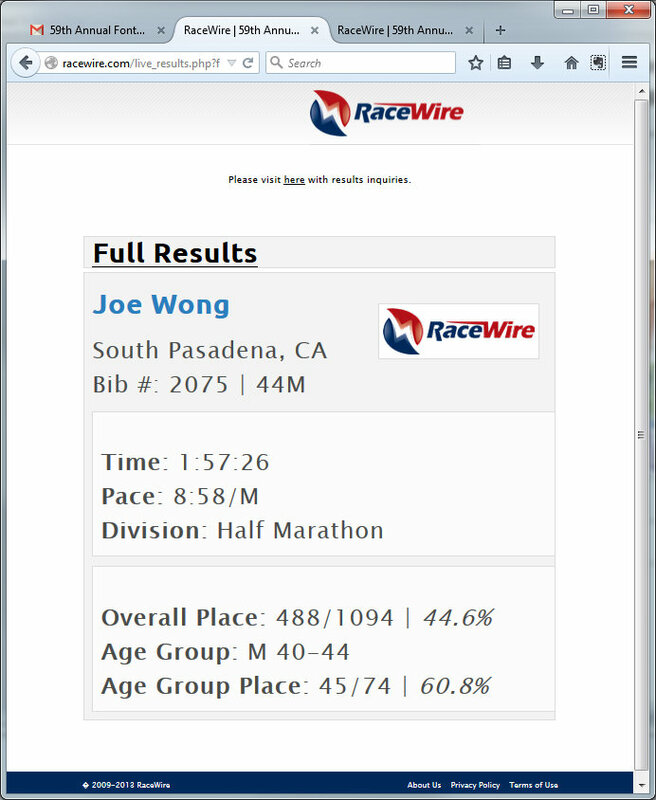 Official Race Chip time: 1:57:26 finish time. I broke the 2 hr mark! Super excited. I’m usually not interested in times but in the back of my mind I always wondered if I could do it. 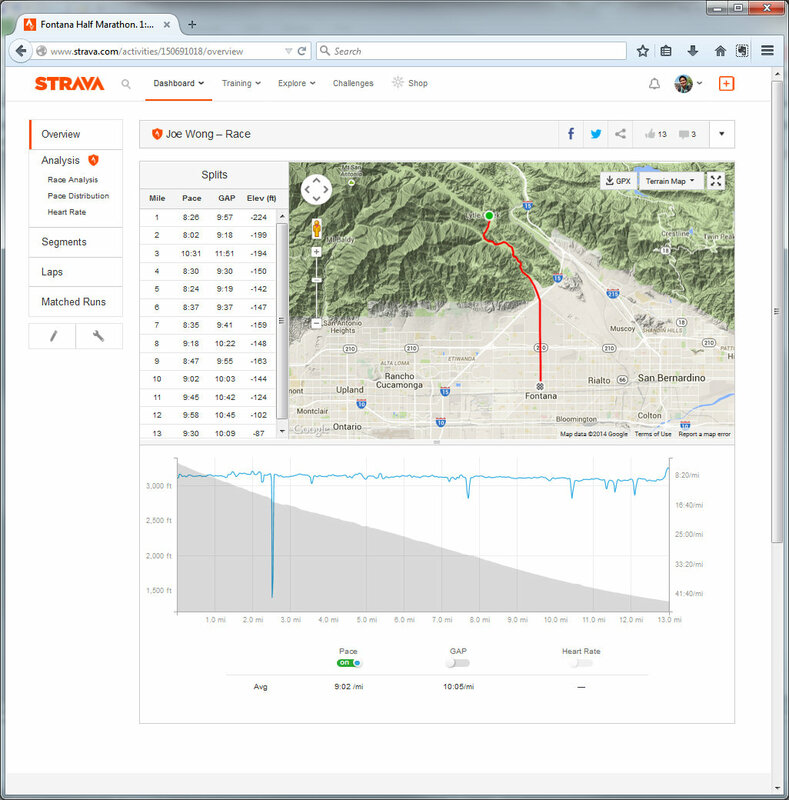 My Garmin only got 13.0 miles, so I got ripped off on the Strava records. Oh well. Today was the perfect day. The Fontana Half a downhill race. The weather was great for a fast run. And some great friends along the way to cheer you along. Day started at Zero Dark Thirty. We met at Lynda 4:15am. Picked up Marvin in Monrovia and we landed at Fontana by 5:20am. Perfect parking spot across the street from the finish line. There was plenty of time to pickup packet. They messed up my , and catch the bus to the top of the mountain. At the top, there’s a camp ground that we wait at until all the bus drop off the runners. Another potty stop at the top. There’s a little house that we wait at. It shelters us from the cold breeze. The race starts up in the San Bernardino Mountains. It’s a fast downhill for the first 6 miles then it flattens out and straightens out toward the finish line. Lucas took his iPhone and snapped some shots on the way down and shared them with me. Thanks, Lucas. Everyone had a great race. Lucas completed his first half marathon! Bill placed 3rd in is age group. Marvin was super fast and had a good day. Yuri had a super fast race too. Lynda beat me and was super happy with that. And I finished under 2 hours. We saw Catherine and a friend too. She said she had a good race too. The weather at the top was not too cold. The clouds broke and warmed us a little whole we waited. Flying down the hill, I felt really good on the way down. As the course flattened out, the clouds were back and kept us cool. It was awesome. The push was hard on the flats but much more manageable in the cool. We had a huge scrumptious brunch at Flappy Jacks in GlenDora. Yum. Marvin and I had the Flappy Special German pancakes rolled with fresh berries. Our server spoiled us with a special Nutella sauce on top. Bus Ride to the Top of the Mountain. Marvin and Me.